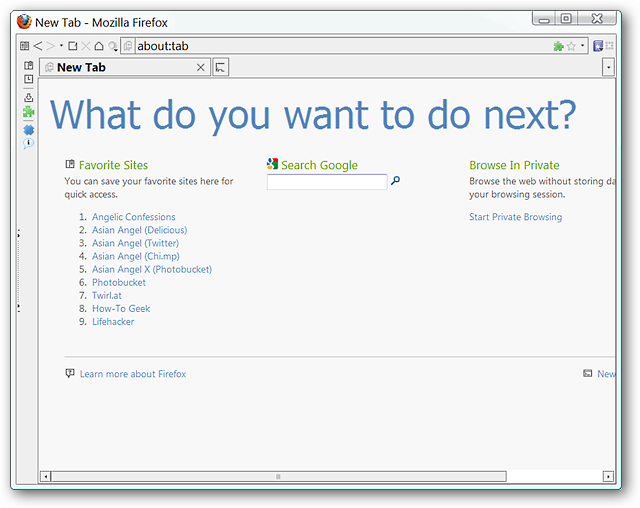 Do you like the Panels Sidebar in Opera and want the same functionality in Firefox too? 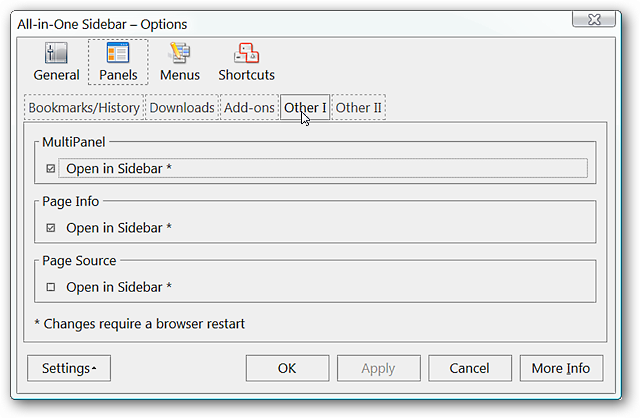 Now you can with the All-in-One Sidebar extension. 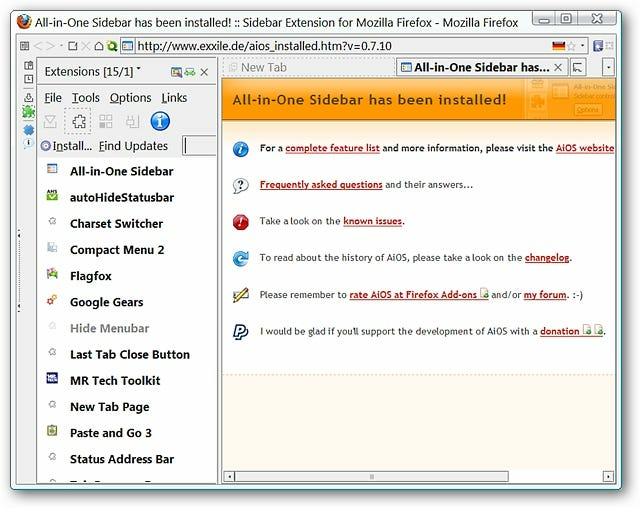 As soon as you have installed the extension and restarted Firefox you will be presented with the fresh install webpage. 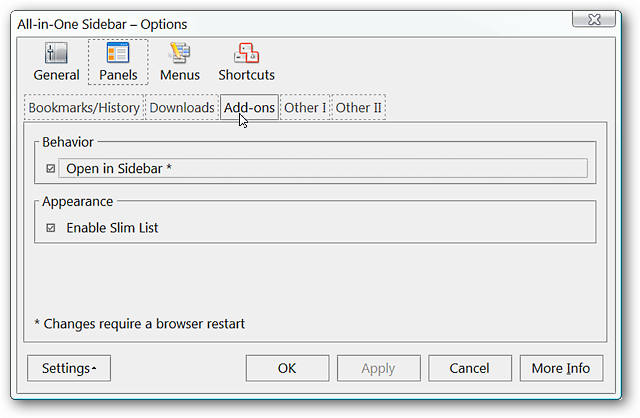 The “Extensions Sidebar” will also be visible to allow immediate access to All-in-One Sidebar’s options if you are ready to start customizing at that moment. This is how the sidebar looks in minimized mode…not taking up much room at all. You can collapse the sidebar even further into a slim mode to help conserve screen real-estate whenever needed. Display a webpage, view the source code, access about:config settings, or view information about a webpage in the “Multi-Panel & Page Info Panels”. Decide which side of the browser that you want your sidebar to be active on and the exact width sizes in pixels in the “Appearance Tab”. Note: The default setup is shown here. 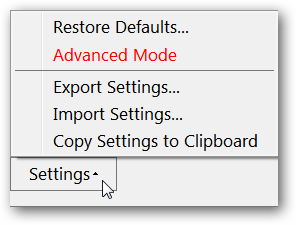 To access “Advanced Mode” use the “Settings Menu” in the lower left corner. 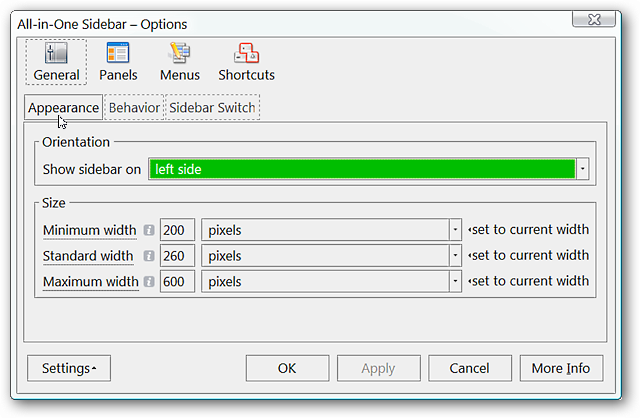 Determine sidebar/toolbar behavior at startup and in full screen mode in the “Behavior Tab”. 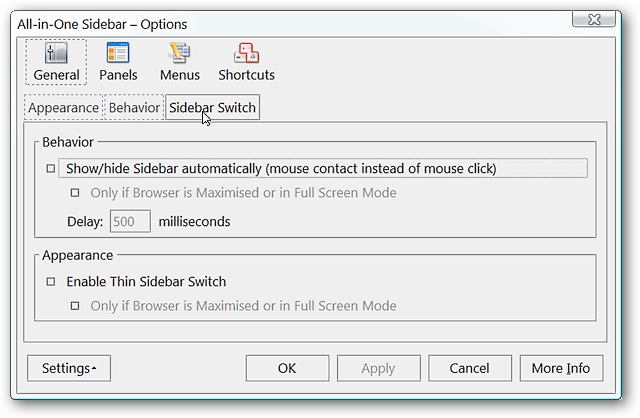 Enhance switch behavior and appearance in the “Sidebar Switch Tab”. 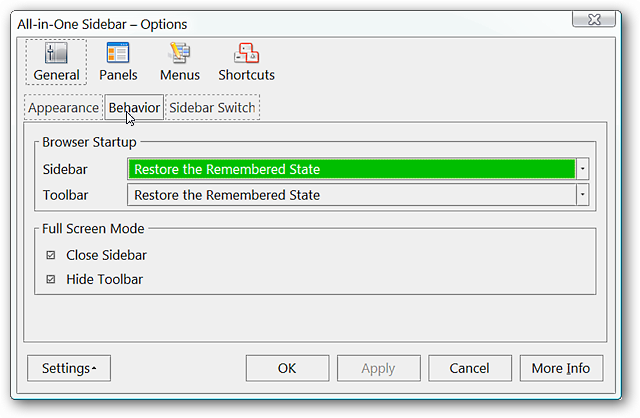 You can choose to deactivate the bookmarks and/or history functions in the “Bookmarks/History Tab”. 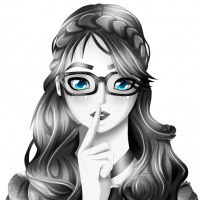 Decide if and how your downloads will appear in the sidebar in the “Downloads Tab”. 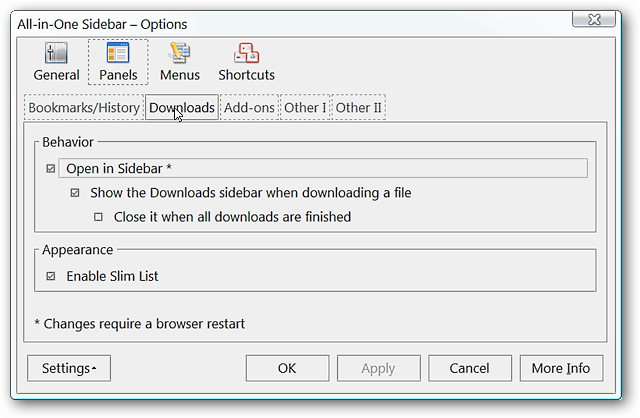 You can disable add-ons appearing in the sidebar if you prefer using the regular window or enable the regular style appearance in place of the slim list style. 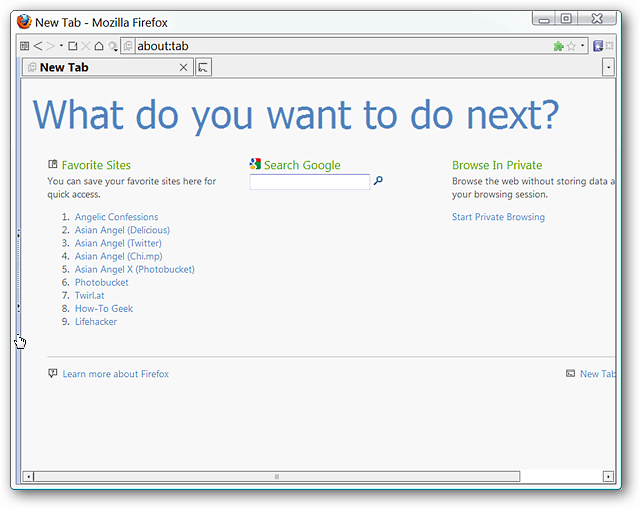 Select the functions that you would like to appear in the “Multi-Panel” in the “Other I Tab”. Decide if you would also like the “Error Console” to open in the sidebar and which visual style that you prefer in the “Other II Tab”. 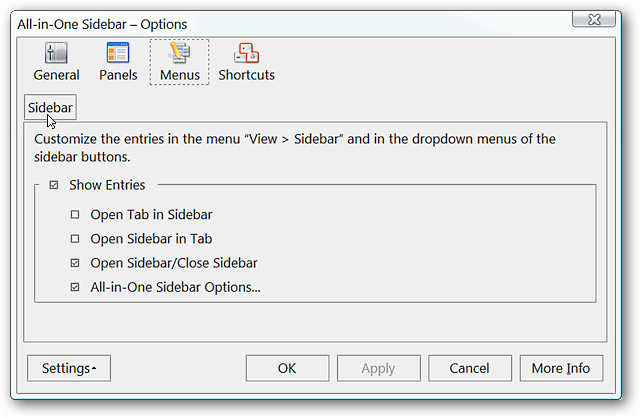 Choose the additional commands available in the “Sidebar Sub-menu” in the “Menu Area”. 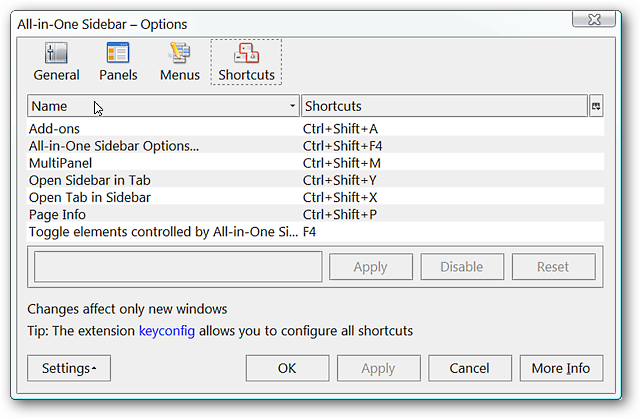 Make any desired changes to All-in-One Sidebar’s keyboard shortcuts in the “Shortcuts Area”. 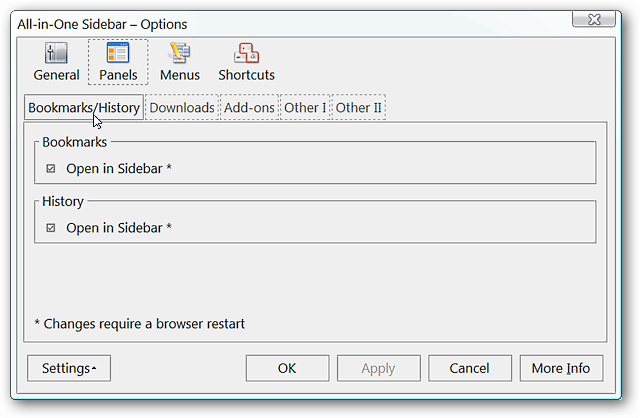 In the lower left corner of All-in-One-Sidebar’s options you can restore the default settings, access the advanced options (these add some extra tweaks to the various options shown above), export or import settings, and copy All-in-One-Sidebar’s settings to the clipboard. 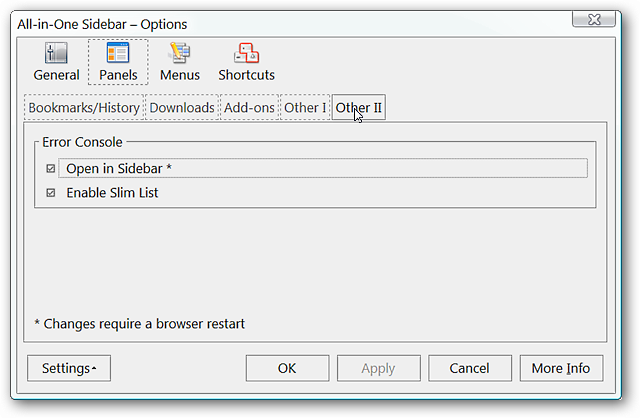 If you are wanting to add some nice customizable (and multi-functional) sidebar goodness to your Firefox Browser, then All-in-One Sidebar is an extension well worth looking at.